After having several issues with my Aux battery (car wouldn't charge, car wouldn't go into ready, car shut down while in ready mode), I now keep the Aux battery on a battery maintainer when the car is parked for longer than overnight. I also use the maintainer when I set the charge timer, so that the Aux battery is never deep cycled. To make it very simple to hook up the maintainer, I affixed a pigtail permanently to the Aux battery, and passed the connector from the "engine bay" up through a gap between the hood and the louvered plastic cowl. 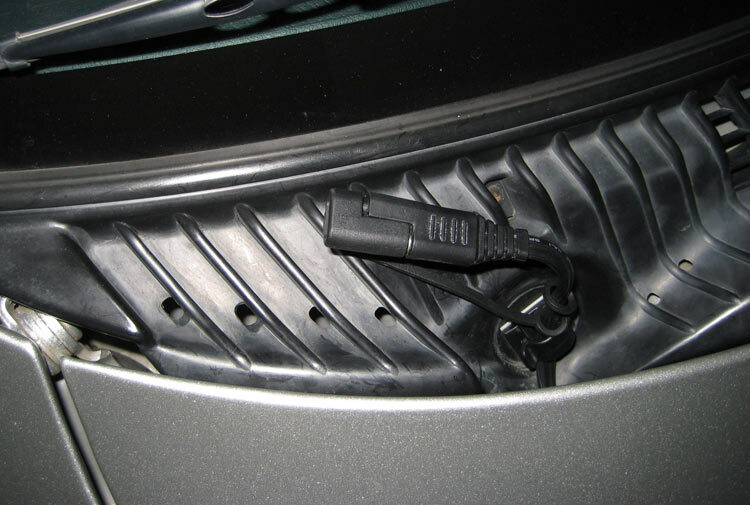 The wire is held in place by a UV-resistant wire clip that is attached to the plastic cowl. 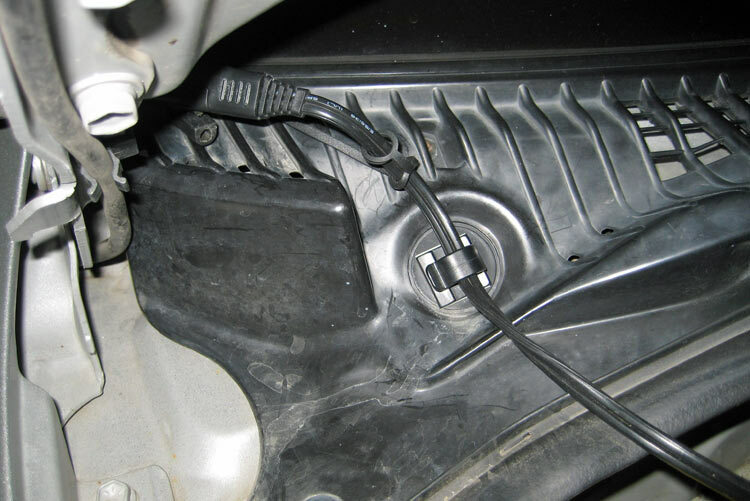 When not in use, the connector tucks in out of sight behind and under the upper lip of the hood. I had originally installed the connector so that the hood had to be opened for use. That proved to be enough hassle that I wasn't using the maintainer enough. Now it is as easy as charging the traction pack with the paddle. 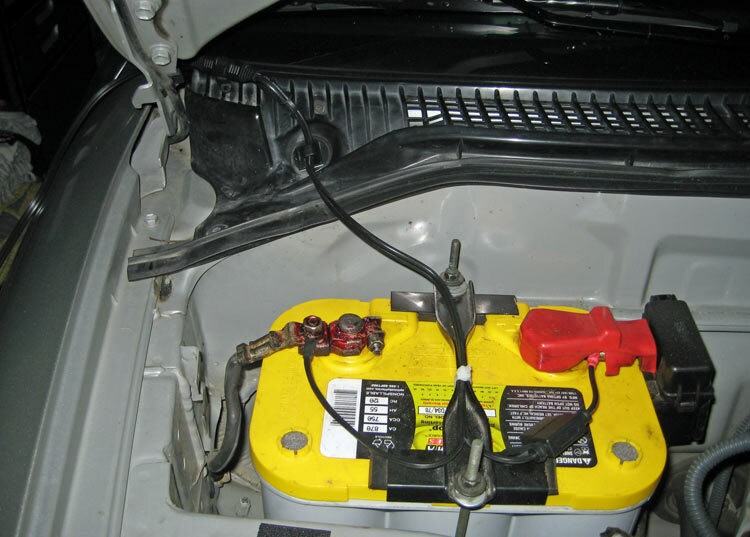 Here's how easy it is to connect to the Aux battery without opening the hood. 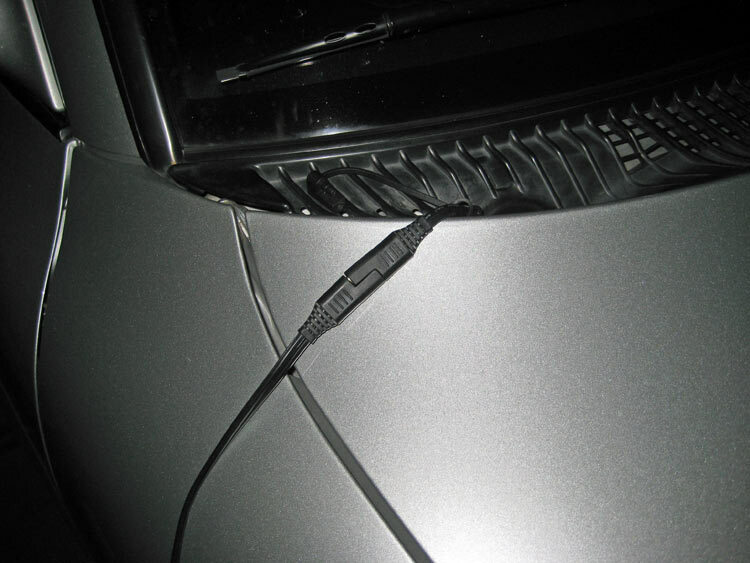 Just pull the little pigtail from under the lip of the hood, and plug in the mating charger cord. I have lubricated (dry teflon) the connector so that if we drive off without remembering to disconnect,the connection pulls apart VERY easily. The wire is zip-tied to the battery hold-down, so there's never stress on the terminal end of the wire. Here is the detail of the connector, with protective cover in place... and the black wire clip that holds it in place on the cowl when not in use. We're looking at the outside of the car with hood down - same as above. Here's all the "under hood" stuff. Notice the white zip-tie on the battery hold-down to act as stress relief. Visible here is the flat spot where I affixed the cable clip on the plastic cowl. Detail below. And finally... detail of the clip with the hood up. Nice of Toyota to make that perfect little flat spot to attach the clip. Jeez. Wish I'd cleaned it first. Nothing hides from the flash!